As development offices in non-profits of all sizes and shapes turn greater attention to attracting, closing and selling real estate gifts, I’m finding more and more charities are particular interested in exploring retained life estate possibilities with their donors. The owner(s) of a personal residence or agricultural property can donate that property to charity, retaining the right to use the property for the rest of their lives (or for a fixed period of time.) This is known variably as a retained life estate, a reserved life estate, donating the remainder interest in the property, or retaining a life tenancy in the property. Though title in the property changes hands, the “life tenants” retain full use and control of the property, with full responsibility for taxes, utilities, maintenance, etc. A clear and detailed written agreement is essential to spell out all the responsibilities and rights in such situations, including dealing with incapacity, vacating the property, etc. Despite continuing to live in or use the property, the donor is entitled to a charitable tax deduction in the year of the gift that is based on the appraised value of the property (adjusted for their life expectancy), the applicable IRS discount rate, and other factors. Whenever a client tells me of a donor whose bequest intention suggests that a residential or farm property will be coming to the non-profit through the estate, my advice is that they should schedule a visit soon to that donor in order to review the benefits of donating the property in question now, and retaining a life estate. Chances are that the property owner is not aware that they could accomplish their aim – having the property pass to the charity for sale after their death – through a retained life estate gift, rather than by bequest. They’re probably also not aware of the several major advantages to making the gift during one’s lifetime, principal among them being the tax deduction available when making the gift now, rather than at death. And there’s also the benefit (for some) of being recognized now for one’s generous gift, as opposed to recognition after death. Those of us in the gift planning business cannot assume that a donor in such a situation will be aware of the retained life estate alternative through their attorney or accountant of financial planner. It rarely works that way. Rather, it generally falls to us, as gift planners representing non-profit organizations, to explain the whole menu of options for disposing of real estate, including the retained life estate. A critical difference between donating the property now while retaining a life estate, as opposed to leaving the property through one’s will, is that the retained life estate arrangement is irrevocable (thus making available a charitable tax deduction.) One can always change one’s will. Not so with a retained life estate. Which means that anyone considering such a gift arrangement should think very carefully about it and seek expert professional advice. It also means that those of us who are gift planners should be aware that this is a gift arrangement only suitable for donors with sufficient financial resources to get through their retirement years without needing the real estate in question. 1. A retained life estate gift can accomplish essentially the same charitable results as leaving a property by bequest, with two important exceptions: the owners are entitled to a current income tax deduction when they donate the property subject to a retained life estate (unlike a gift by bequest); and the donors can enjoy the satisfaction, and praise, for making the gift in their lifetimes, rather than such recognition coming posthumously. 2. In the case of a property gift likely to generate a very large tax deduction, the donor can make fractional interest gifts over time, thus spreading out their tax deductions over sufficient time to enable use of such large tax deductions. 3. The non-profit recipient of the gift, based in Virginia, was able to assemble a team of experts to structure and close this gift in Texas. Such expertise had its cost, but was well worth it in relation to the ultimate value of the gift. George and Jennifer Jackson were owners of a 150-acre ranch in Karnes County, Texas, that they used on the weekends and as a base of operations for their frequent birding expeditions. Their primary residence was on the outskirts of San Antonio. The Jacksons were long-time members of the National Wildlife Federation, based in Virginia, as well as other conservation organizations. They had no children and had decided some years ago that they would leave their ranch by bequest to a conservation organization. When they became acquainted with the option of donating property during one’s lifetime, while retaining rights to continue using the property by way of a retained life estate, they contacted NWF and other organizations to find out who might be interested in working with them on such a gift. The Jacksons decided to make their gift to NWF because of the good work of NWF, but also because of NWF’s access to the sort of expertise necessary to complete a gift of this sort within a reasonable period of time. Along the way, NWF’s due diligence included a title search, an environmental assessment, consultation with knowledgeable local realtors, and careful review of the mineral rights lease. The Jacksons, before finalizing their gift, worked with NWF, their accountants and their appraiser to estimate the tax deductions that their gift might trigger. The parties also worked diligently on the details of a life estate agreement that spelled out, among other things, the responsibilities of the parties for property taxes, utilities, repairs and maintenance, etc. during the time of the life tenancy. This agreement also made it clear that the Jacksons would have sole claim to any mineral rights lease payments made while they continued to use the property. In the end, the Jackson’s donated a 50% undivided interest in the ranch (including its mineral rights, subject to lease) to NWF, subject to a retained life estate. They also signed a document pledging the donation of the remaining 50% interest (also subject to a retained life estate) six years later. This arrangement allowed them to spread out their tax deductions for a period of up to twelve years (because they didn’t have sufficient likely adjusted gross income to use their deductions in six years or fewer), but it also provided NWF with the assurance that it would at some point have 100% ownership of the property, putting NWF in position, at some point after the Jacksons had died (or relinquished their life estates), to market the property. The gift closed prior to year-end, which met the Jackson’s tax planning objectives. When they filed their taxes the following April, they were able to claim a very substantial deduction, in anticipation of continued deductions in the following five carry-forward years. After those carry-forward years, they expected to proceed with the donation of the remaining 50% undivided interest in the property. Q: What’s the best way to approach a donor about a possible real estate donation? A: First, you’re on the right track by thinking in terms of approaching potential donors, rather than waiting for them to contact you about their real estate. In fact, the most transformative real estate gifts I’m seeing these days are those that result from conversations initiated by a development officer. What I believe is most successful is this: 1) Do your research (internally or with assistance from outside contractors) to identify folks who fit the profile of a real estate donor. 2) Decide who is best positioned in your institution to visit with this prospect. 3) Be clear on what types of real estate gifts your organization will and will not accept. (Hopefully your gift acceptance policies reflect best practices in this area.) 4) Rehearse with a colleague the way you will handle the conversation. 5) Be confident that if you’ve done your homework well (i.e. if the prospect really does fit the profile of a real estate donor) your prospect will likely welcome a conversation about a situation that is very much on their minds these days. 5) Recognize that you don’t need to be an expert on the technical aspects of real estate gifts, and trust that that expertise (hopefully) resides back in your shop or with outside assistance you can tap. 6) Enjoy your conversation, and keep your ears tuned to real estate situations that might lend themselves to gift scenarios. Q: How worried should we be about environmental problems in gifted real estate? A: It’s my experience that very often the risk of environmental contamination on a property is overstated, often reflecting a story involving acceptance of a property 30 years ago with a gas tank, or with spilled chemicals, etc. Often this story, apocryphal or not, has become legend and been used to cut off discussions of real estate gifts. The reality is that tried-and-true gift screening and due diligence approaches commonly in use today would quickly identify the existence of such an environmental problem and would lead to dismissal of the gift possibility very early in the process. Increasingly, non-profits are agreeing to cover the cost of a Phase I environmental assessment as a cost of doing business. Also, sometimes it’s worth looking at a property that might require some investment in clean-up. Would it make sense to turn down a $1,000,000 gift because of a $10,000 cleanup? Q: How do I convince my bosses to open the door to real estate gifts at our institution? A: My September, 2014 newsletter was devoted entirely to this subject. Q: Does an organization have to be a particular size before it considers real estate gifts? A: I am seeing organizations with 2 and 3 person development shops ramp up their capacity to handle real estate gifts. And I am seeing smaller development operations seek real estate gifts, knowing they can turn to outside expertise (community foundation, sometimes an area university, a real estate gift consultant) to help them handle the gift. Some community foundations look for opportunities to partner with smaller non-profits in structuring and managing planned gifts involving real estate. Q: What should be our approach when we know a donor intends to leave us property through their will? A: If the property they have in mind is a residential or agricultural property, you should arrange to visit them next week to explore the suitability for them of a current gift subject to a retained life estate. Most property owners, even those with excellent legal and tax counsel, aren’t aware that they could achieve essentially the same results as a gift by bequest by making the gift now, retaining a life estate. The difference is that in the case of retained life estate gift they are entitled to a substantial income tax deduction, and they would have the satisfaction (and recognition) of making the gift during their lifetime. 1. A retained life estate gift of this sort can accomplish essentially the same things as leaving the property to charity in one’s will, except that in this case the donors are entitled to a very substantial current income tax deduction and enjoy the satisfaction and recognition of making a gift here and now. 2. A coop apartment is considered a personal residence for purposes of making a gift subject to a retained life estate. Technically, the property that is gifted is the shares of the cooperative corporation. 3. The net effect of making a gift subject to a retained life estate in a case like this one is to increase after-tax income, because of the cash savings coming from the current tax deduction that is triggered by the gift. Dr. Jacobs, a graduate of Pioneer Medical School, and his wife, both in their early 80s, own a coop apartment in New York with an estimated value of $8,000,000. They have owned it for over 30 years, so their tax basis in the property is very low by comparison. They love living where they are, and have no desire to move for some time, assuming their health allows. As Dr. Jacobs moves further into retirement he has considered making a substantial “naming opportunity” gift to the Medical School. They had planned to leave the coop to the Medical School through their estates, but a gift officer from the School introduced the possibility of making the donation now, subject to a retained life estate. When they realized the bump to their after-tax income that would result from the charitable deduction triggered by such a gift, they became especially interested. Medical School staff and the Jacobs’ advisors are confident that technical issues associated with such a gift can be worked out: transfer of the Jacobs’ lease from the Coop Corporation to the Medical School, with the School subsequently sub-leasing the property back to them; full compliance with all of the requirements of the Coop Corporation Board regarding rights of first refusal, approval of the coop buyer, etc. They could continue to live in their wonderful New York residence. The value of the substantial tax deduction (in the vicinity of $6 million, useable over 6 years) resulting from such a gift would increase their after-tax income for the years ahead. They could experience the satisfaction of having a building named after them now, during their lifetimes. Neither they, their executor, nor their children, would have to worry about selling the property down the road. They would make a very significant gift while retaining all of their liquid assets. The gift would be irrevocable, allowing them to proceed with naming opportunity discussions. The gift would be publicized, and would no doubt inspire others in similar circumstances to consider making a similar gift. The Jacobs’ other assets – cash, insurance, retirement funds, other real estate, etc. – remain available as possible future gifts. Stay tuned. I’ll let you know if this gift proceeds to fruition. Land conservation organizations are especially well-suited to develop robust Legacy Giving programs (I prefer that term to “planned giving”) emphasizing real estate gifts. I truly believe that such efforts hold the prospect of long-term financial security and permanence for these organizations through endowments and stewardship funds. Why? Three reasons. First, land trust can make a better argument than almost any other organization for having to be around forever. Land trusts, after all, exist on the premise that land owners can entrust to them the permanent protection of their land. Asking for funds to assure the permanent stewardship of land matches up very nicely with the motivations of people wanting to assure a legacy – for themselves and for landscapes of meaning. Second, with more U.S. household wealth in real estate than in any other asset class, property gifts of all sorts are an especially important component of Legacy Giving programs. And conducting real estate transactions is one of the core competencies of land trusts. When land trusts turn their real estate expertise to structuring and closing gifts of non-conservation real estate (think vacation homes, ski condos, apartment buildings, etc. ), they have put themselves on a path toward long-term financial security. Third, an essential feature of successful planned giving programs is the long-term cultivation of personal relationships with donors. In the course of working with property owners and other community members to bring permanent protection to land rich with history and meaning, land trusts develop especially close and trusting relationships. These relationships often deepen over time, with the potential to produce enduring, sometimes transformational, gifts. More and more land conservation organizations are learning to talk with donors about the whole menu of gift techniques – outright gifts, bequests, charitable remainder trusts, charitable gift annuities, retained life estates, fractional interest gifts, etc. And they growing more skilled at discussing their donors’ whole range of assets – real estate of various types, securities, retirement plans, insurance policies, business interests, etc. – in order to help aging members and donors dispose of assets no longer needed. The result of this process of inquiry and problem solving many times results individuals and families realizing they have charitable capacity they never thought they had. When this happens, it brings joy and satisfaction to all involved. Anytime a donor or property owner indicates they might be leaving your organization an interest in real estate through their will, you should acquaint them with the pros and cons of the retained life estate as a way of accomplishing essentially the same thing, but with extra benefits. Conservation easement stewardship visits should be regarded, among other things, as an opportunity to deepen relationships with the property owners. And land trust representatives on such visits should be trained to keep their eyes and ears open to hints of other possibilities. People will seldom give your organization a property unless they know your organization is interested in real estate gifts and knows how to handle them. In the 1990s, Owen and Ellen Love donated a conservation easement on their 662-acre farm in Kalamazoo County, Michigan to American Farmland Trust. Besides being proud of protecting the prime agricultural soils on their farm, they received a substantial charitable donation deduction which they used to offset some of their farm income for several years. A few years later, on an otherwise routine easement monitoring visit, Owen and Ellen hinted that they were re-thinking their wills, based on dissatisfaction with the university they originally hoped would receive their farm by bequest. Conversations led to the possibility that the farm might be left instead to American Farmland Trust. In the months that followed, I worked with Owen and Ellen, their advisors, and their children, to explore the pros and cons of a bequest gift of the farm versus a life-time gift of the protected farm, subject to a retained life estate. In the end, the Loves decided to deed away the farm during their lives, retaining the right to live on and rent the farm for the rest of their lives. 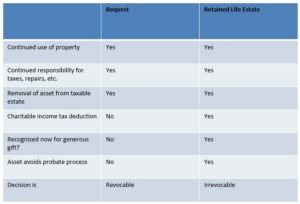 They were motivated by two things made possible by a retained life estate gift that aren’t possible in a gift by bequest: 1) a substantial income tax deduction they could claim at the time of the gift (which, based on actuarials, amounted to about 75% of the value of the easement-restricted property); and 2) the satisfaction of knowing that during their lives they had made a hugely significant gift for land conservation that might inspire others to follow suit. In the years that followed, Owen, then his beloved wife Ellen, died. After some years of renting the farm to a local family, AFT sold the easement-protected farm, in 2010, to another local farm family. The bulk of the $3 million of sales proceeds funded the Owen and Ellen Love Revolving Fund for Farmland Protection. 1. A retained life estate gift can accomplish essentially the same charitable results as leaving a property by bequest, with two important exceptions:the owners are entitled to a current income tax deduction when they donate the property subject to a retained life estate (unlike a gift by bequest); and the donors can enjoy the satisfaction, and praise, for making the gift in their lifetimes, rather than such recognition coming posthumously. What Accounts for Increased Real Estate Gift Activity?